I'm calling the stage we're living in right now "the in-between" (kind of like the upside down for any Stanger Things fans out there). 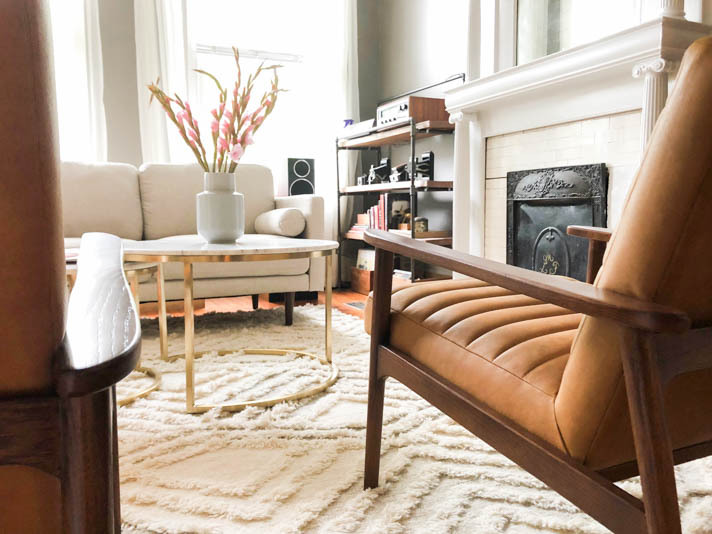 What I mean is — we're amidst a season of juggling home updates, all at various stages, which can feel a little unsettling at times. On the bright side, we're on the home stretch with our front room and the running projects we've got going on are all things we're excited about. You know, the fun kinds of cosmetic updates instead of necessary ones like a new roof or bubbling plaster walls that blow the budget with nothing to show for in the end. The front room has been a running marathon makeover around here and we're so close to the finish line we can almost taste it. We're just waiting on a few final pieces of furniture to arrive and configure — and I'm still debating whether or not I want to make art for the walls before we can call it a done deal. In the meantime, we've already been enjoying using the space as a new sitting room to listen to music and kick our feet up. We can't wait to share the final outcome here on the blog in the next 2 weeks! Beginning this week, we also kicked off the largest home project we've tackled to date — a full kitchen renovation. And by renovation, we mean a complete gut job! Over the weekend, Tim and I pulled everything we own from the cupboards in preparation and used it as an excuse to pare down on all the gadgets we have to those we regularly use. It was also a good way to completely clean out the freezer and pantry in the same way. Isn't it funny how we keep certain things for "someday" and then years fly by? The picture above is a good representation of the kitchen in its most current state, missing island drawer and all. I'm working on a larger post with alllll the details behind our kitchen renovation, and in the meantime, we're trying to wrap our heads around how we'll survive without a kitchen over the next 4 weeks. Those of you that have done it — we could use all of your tips! Yep, that's Tim up there pulling out the last bits of the old staircase and landing we've had in the back since moving in. Just call us crazy. The timing of the updates out back was actually more due to circumstance than anything else — we'd originally planned to tackle the backspace early next year. That said, our next door neighbors sold their house to a local flipper 2 months ago and that space is undergoing a full gut job (yep, used gut job twice in this post)! 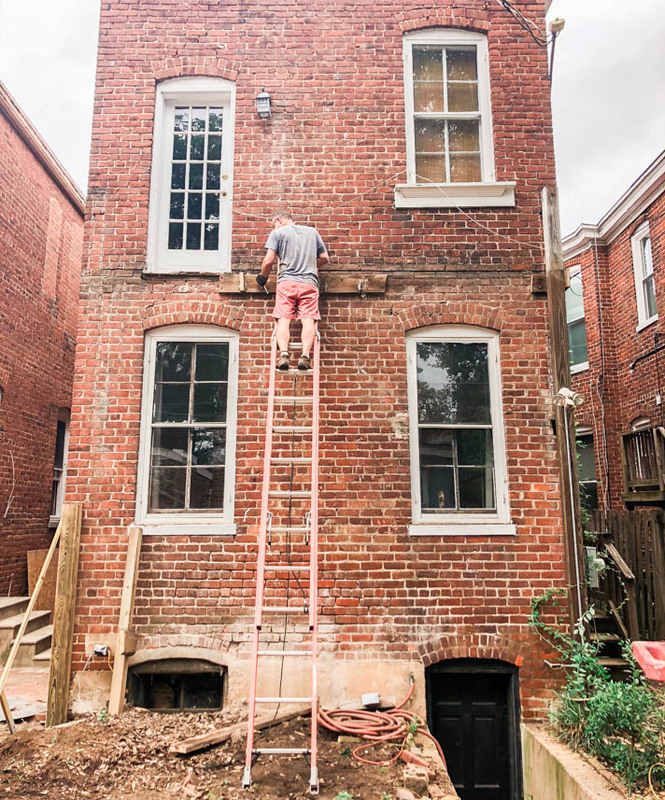 Because of the renovation and close access to all the experts, we were able to get professional help demoing the wooden staircase out back. They also installed a brand new fence along the threshold of the two property lines and we'll have a matching version installed on the other side once the neighboring house is complete in early July. 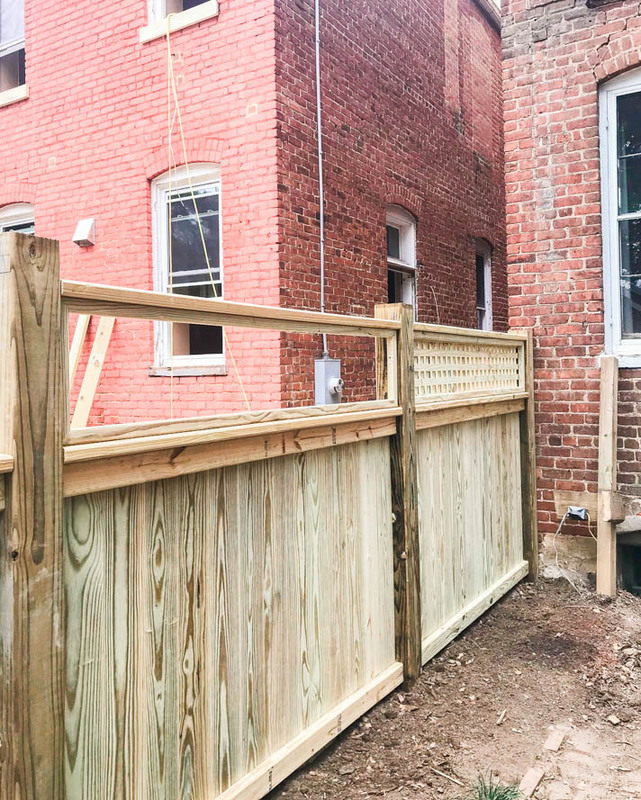 Even though the back is in a state of transition, we're loving the more open feel of the space and added polish the new fence brings. Basil, on the other hand, is not sure what to think about not having a perch to climb up and overlook the neighborhood like Simba (aka Lion King). As you can gather, there's a lot going on — and all at once around here. We're learning to love the process but will be eager to sit back and enjoy each space as they come together this summer. If you're interested in more real-time progress or behind-the-scenes views of each project, we try to make regular updates over on Instagram, especially stories. Come say hello! Oh, I know that feeling... I lived in renovation limbo for months a while ago. I had no kitchen for almost 2 months, bc the gutting/prep work before the new one was installed took so long (long story). Before taking the kitchen out, I cooked as many meals as I could portion up and fit into my freezer. I then put the fridge-freezer in the living room, filled a drinks trolley with the essentials as far as plates, bowls, glasses, cutlery and non-chilled groceries went, and put that next to it. I had a microwave combination oven at the time, and put that on a small table next to the fridge and trolley, and voilà: a small but functional emergency kitchen. Everything else went into boxes and was stored out of the way. It was two months of cooking oven dishes, reheating frozen meals and eating with friends, but it didn't feel like too much of a chore. Dishes may be a challenge, so try to use as few pots and pans as possible. Without a dishwasher, pans tend to be the most unwieldy part of dishes to wash.
Oh, and an electric kettle is a lifesaver. I hadn't thought about an electric kettle — great idea! 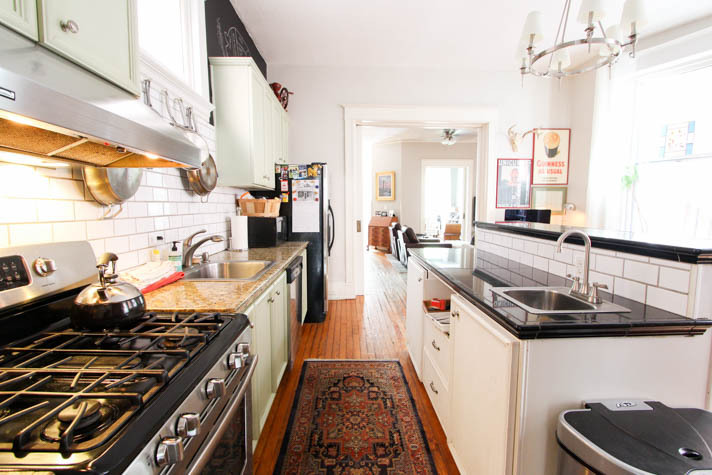 The no dishwasher and sink parts are intimidating, and love your idea for a trolley station / emergency kitchen. Thank you! You could pretend you live in a foreign country, a lot of them have no ovens and usually all they use is a wok (over a portable gas burner) and a rice cooker. That and my grill is all I have been using for years. https://www.youtube.com/watch?v=dr5g852PZJA&t=196s (portable gas burner, I love it). This is great, thanks for the tips! We'd thought about doing lots of grilling but quickly ran into the issue of washing dishes — love the wok idea!